Within the business world each person has to continuously make choices related to ethics. It is an everyday part of life. In many fields ranging from the practice of law to engineering services there are codes of ethics to which people must adhere. In order to receive the professional license in a given field, individuals must sign the code stating they are willing to abide by its ethical standards. As part of the codes, they state how people should and should not behave on matters of ethics. They also state in many cases that a failure to adhere to the code will result in the revocation of the license. As important as ethics are, there is no business code of ethics that must be signed in order to enter management. In order to be a manager, one does not have to sign a paper stating they will follow specific standards for the rest of their career. There is not a code of ethics for managers that must be signed prior to entering the management arena. Although most corporations have their own set of company policies and procedures, there is not a set standard through the business world. « What is in a Title? I think that the problem with Ethics is in the definition of Business itself. Business by definition looks for ways to maximize its profit for its stakeholders. Thus, as an entity business can’t have any ethical standards. 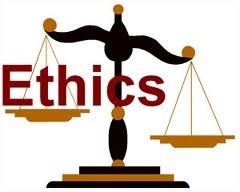 Also, by ethics……..we mean the moral code. Its not documented anywhere or penalized by any parties. So, there is no punishment for breaking these code of conduct, which are not clearly defined anywhere. I guess, its going to be the question for our next generation to answer. We can definitely be work according to our morals. But when it comes to the business, I don’t have any answer. Unfortunately, you are very right regarding business and ethics. Since there is not a code of ethics in business, there is no set standard for how people must behave. Because there is no standard, there is no board or regulator to enforce ethics other than the law and law enforcement. The question I would pose is, should there be an ethics code? Should there be a guide that people should follow? If so, how should this be set up?